Here is the current food truck schedule. 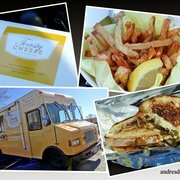 We have food trucks every Thursday-Saturday for dinner (typically 5-9) and Sunday for lunch (typically 1-4). Please note that some times the food trucks change or cancel at the last minute. Check Facebook or back here for updates.